Learn how to turn wire and beads into fabulous jewelry. Crochet jewelry makes a statement. It is an easy way to accessorize any outfit, elevating it to head-to-toe fashion. Beautiful crochet jewelry can be made of thread or yarn, of course, but you really expand your options when you learn to crochet with wire and beads. These techniques, which aren't as difficult as you might guess, help you to create high-end jewelry perfect for yourself, gifting or even selling as an artisan. This sophisticated bracelet is crocheted using 26 gauge permanently colored copper wire. 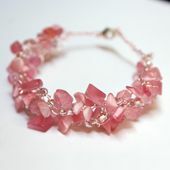 It is accented with two different kinds of beads: rose-colored cat-eye chips and glass seed beads. The simple chain stitch is the only crochet stitch you need to know to make this design, so it's a perfect project for starting to learn to work with wire and beads. This bracelet is crocheted using wire, red coral beads, and glass seed beads. It is reminiscent of fire and really adds passion to any outfit! This cuff-style bracelet is accented with beads, but it's really the wire crochet technique that catches your eye in the design. It is a great design for the Christmas holidays when worked in red and green as intended but use the pattern with other colors of wire to create elegant cuff jewelry to use throughout the year. If you really want to get festive for the holidays then give this free crochet pattern again. Use green wire and red beads to make adorable Christmas tree earrings. There are several different ways you could wear this gorgeous flower pendant. You could put it on a simple chain, or you could make it the focal point of a fancier necklace. It is crocheted with tiny seed beads and very thin wire, only 34 gauge, so even though the flower pattern itself is simple this is not considered a beginner pattern. This bracelet is crocheted using medium or large sized beads plus 26 gauge wire. It is a very unique pattern in that it uses love knots (also known as Solomon's knots) to encase each bead in place. This is a beautiful design that will certainly become a statement piece in your wardrobe. This is a set of patterns to create a long necklace, a choker necklace and a bracelet. These three items are all crocheted using 28 gauge wire. Crochet leaf patterns can make great accessories at any time of year but of course are particularly perfect for autumn. These adorable earrings are made with wire so add luxury to your everyday clothing style. This is a simple crochet pattern so it's great for people who are new to wire crochet. Crochet braids are a technique frequently used when making wire jewelry and this is one terrific example of that. 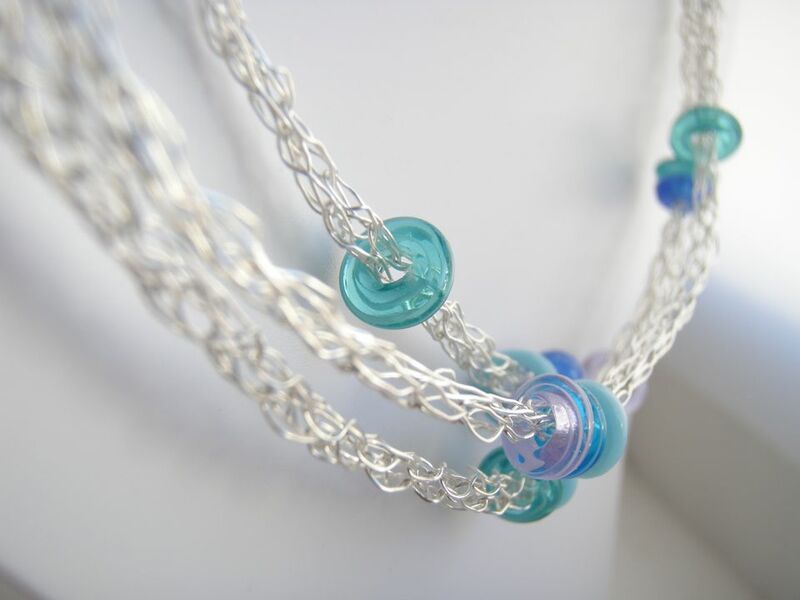 The braided wire is combined with beads for a beautiful lush jewelry design. This is another version of a crochet bracelet made with wire and beads. This is a very simple pattern that includes detailed tutorial-style information so it's another option that's good for beginners to working with alternative crochet materials. This is another tutorial-style free crochet pattern. It shows you how to make a crochet bracelet with wire and beads and offers different closing clasp options. It explains how to adapt a pattern like this to create necklaces and other sizes of jewelry. This is a crochet bracelet tutorial that teaches you how to work a wider cuff-style bracelet with wire and beads. This pattern is by Kara Gunza whose blog offers a number of other great free wire crochet jewelry patterns in addition to this one. Believe it or not these are made using just single crochet stitches! The simple crochet granny square really gets elevated to something fancy when worked in wire! This one incorporates silver beads and freshwater pearls atop the corner of the granny squares to make them even more special. Use wire to crochet a simple daisy flower. Add a simple crochet chain to turn them into drop earrings. Use the super simple chain stitch worked over emerald beads to create this simple but stunning necklace. This is available as a download through Ravelry. Make one of these crochet bracelets in every color using all of your favorite beads. The pattern shows you exactly how to do it even if you've never worked with bead and wire crochet before. Use copper wire to create a very simple ring that you can wear every day. This is a basic crochet jewelry pattern, perfect for building your skills. It is available via Ravelry. This is a really unique pattern because it uses silver embroidery thread instead of wire to give you the look of wire while allowing you to work with thread. The same pattern could be used with actual wire, of course. The design is a pretty flower. This is a bilingual crochet pattern available in Spanish and English. This is one more alternative to crocheting with wire. Instead the pattern asks that you crochet with silver lame cord, designed to look like wire. Again, you could select to crochet with actual wire instead. Either way these are beautiful bead crochet earrings. The pattern is available on Ravelry.